Specialising in Skip Hire / Rental for Domestic & Commercial customers within the greater Christchurch region, we offer a full range of waste removal services which helps us manage the safe flow of waste through each stage with the aim of minimising residual solid waste for disposal in the Kate Valley Landfill located in Waipara, North Canterbury. If the date you have selected for delivery falls on same day, during weekends or a public holiday, the bin delivery will be scheduled for the next working day following that date based on bin availability. However, if your booking is made via the Website on Friday, Saturday or Sunday then delivery may be made on the second working day following, subject to operational constraints. Our cut-off time for orders to be received is 4pm. Orders placed after cut-off may also be considered Same Day orders. Container Waste will contact you and confirm availability and timing. If your removal date falls on a weekend or public holiday, the bin hire removal will be scheduled for the next working day following that date. Any arrangements you would like to make for deliveries same-day, during weekends or public holidays should be made directly with Container Waste as they may not always be available on these days. Excess weight over the stated threshold will be charged at the stated nominal weight charge or part thereof. The bin must NOT contain Tyres, Asbestos, Liquid Paint, Chemicals, Vehicle Batteries, Polystyrene and any other toxic or hazardous waste. A Hardfill bin must not contain any General Waste. A General Waste bin must not contain any Hardfill. 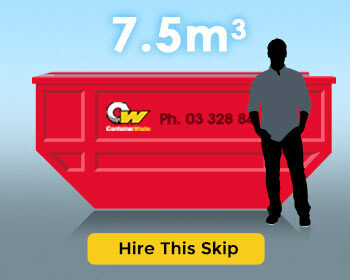 Skips placed on site are not to be re-positioned. Container Waste Ltd. will not be responsible for any damage caused to property on removing a skip re-positioned by the customer after delivery. The bin delivered may vary from that shown. 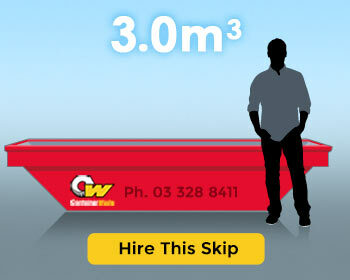 Volume of the bin will match what has been selected however the dimensions and shape may differ. 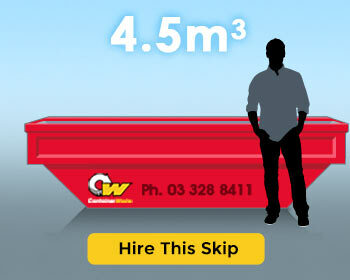 If this range of Skips is not large enough for your requirements see our 15m & 30m Hook load bins.